Big news! We’re very excited to announce that our new game, DragonScales: Chambers of The Dragon Whisperer, has been released today by the renowned game publisher Big Fish Games. Being launched by a top-tier publisher such as Big Fish Games means a lot to us, as our work will be known by more players. DragonScales: Chambers of The Dragon Whisperer is a new tile-matching game, a fun and novel twist to the Match 3 genre. Its gameplay develops on a board composed by hexagonal cells, in which you play scales to form clever combinations of scales having the same color. The dark and ferocious chambers of DragonScales will demand a lot of luck and intelligence. DragonScales was presented in the section “Play it a day early” and today it has been officially released by Big Fish Games, for Windows and Mac. 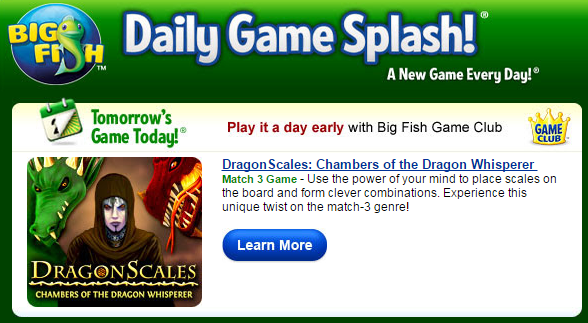 You can try DragonScales here, directly from Big Fish Games.